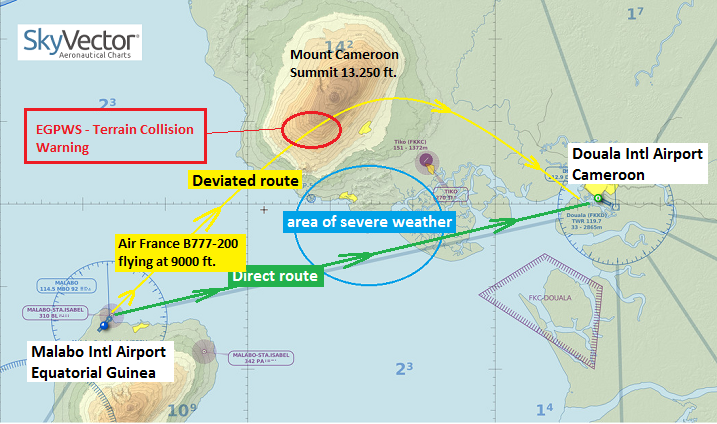 French BEA reported, the aircraft was flying from Malabo to Douala (distance: 62 NM) flying en-route at 9000 ft (FL 90) when the pilots elected to deviate further north in order to avoid thunderstorm activity along their planned route. Whilst flying in darkness and IMC conditions (in clouds) the automated enhanced ground proximity warning system (EGPWS) was activated indicating rising terrain ahead. „Pull up“-warnings were heared on the flightdeck, forcing the pilots to climb immediately to 13000 ft. Then the alarm stopped. 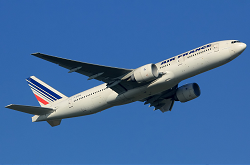 The pilots continued to Douala airport for a safe landing at 20:35L (44 min after take-off). No one on board was hurt. BEA is investigating this serious incident.